We left early, and missed the correct exit on the autoroute finally arriving three hours deep into the belly of a beautiful gorge in the Cevennes. A few weeks prior I had been invited to come to the home and warehouse of one of my favourite brocante dealers. The chance to step inside the real world of an antique textile collector was much too tempting to turn up and so we set a date and brought our French muse invitees on an adventure. Our host houses her vast 30 years in the making collection of antique & vintage textiles collection - appropriately you might say - in an old factory that once made silk stockings in the early 1900s. You couldn't get more off the beaten track and we were all giddy with anticipation at the heavy promise of textile gold. I stepped through the door of her atelier and literally felt my head spin. Boxes upon boxes overflowed with pattern; 8ft high folded piles of antique piqué reminded of the most sumptuous millefeuille pastry, one blanket more beautiful than the next. When there is no apparent order to the glorious contents of hundreds of boxes it is overwhelming to know where to start. I couldn't talk, I had to just focus on one box at a time. Pattern but also silver and gold, and buttons, and lace, and millinery flowers, and thread....hold on I can't concentrate. So much beauty, slices of happiness in each handful. 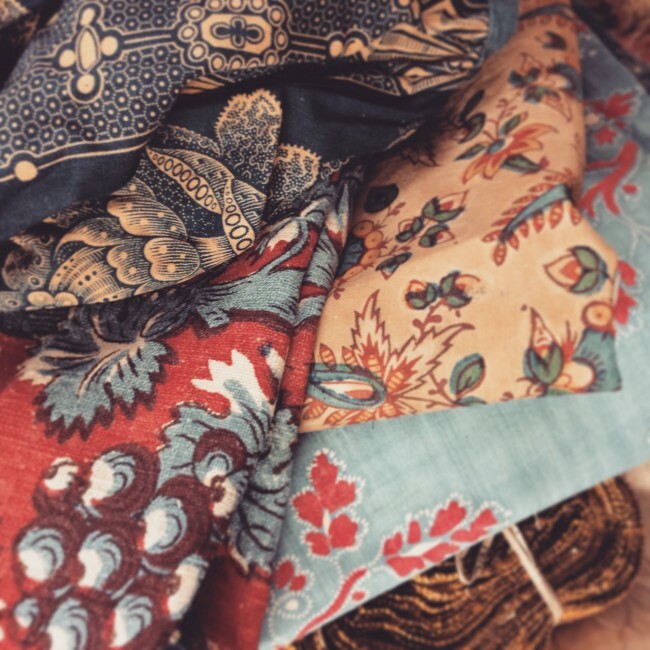 An assortment of Autumn inspired patterned antique textiles that have been pulled out for a more seasonal stock at the flea market. ...and this deliciously moth eaten 1800s indigo piquée - pretty much devoured but achingly beautiful - Sold! It was exhausting, happy work and we were glad when a plate of fresh French pastries was presented - and swiftly demolished - especially those crispy caramelised almond bits - they didn't stand a chance! Sacristains and Palmier - trop bon! Tiny cardboard boxes filled with dress remnants, tulle and glass beads. Altar silk and bobbin lace - oh yes - we'll take that - MERCI! The initalled monogram surrounding the 'coeur de la Vendee' which has been hand stitched into the back of an indigo wool cape from 1790's, worn by a Vendean Rebel, The War in the Vendée (1793 to 1796; Guerre de Vendée) was an uprising in the Vendée region of France during the French Revolution. Our host found this in an abandoned caravan and had to soak and soak and soak it until it came clean. She also shared photographs of her all time favourite items - such as these darned pairs of knee socks. Unforgettable, emotional and something for every textile taste, a happy day of discovery indeed!